Television shows that are popular now, such as 16 And Pregnant and Teen Mom, glorify having a baby at a young age. They show cute little babies in cute pink outfits and not the reality of the situation. What most of these TV shows don’t show you is what comes next --- the screaming toddler, the baby that cries all night, and the need to cart the baby off to daycare the next day. The reality is, babies grow up to be children who need their parents to provide and protect them. The reason these shows are so successful is that they only show the fantasy, and what people want to see. Shelly Ward, a 2102 Bonny Eagle graduate, knows this. As a senior, she and her boyfriend found out they were going to have a baby. Because she had some serious illnesses during her pregnancy, Shelly missed most of her senior year, which caused her to have to repeat the year. Since the baby was born, Shelly has moved out on her own, become more serious, and gotten a job babysitting neighborhood children. Shelly also hopes to someday attend college. Her goal is to be an ultrasound technician. 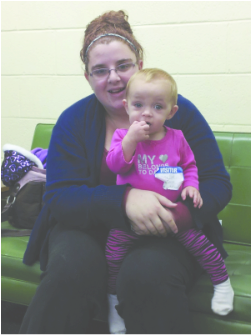 “I knew I had to complete high school to make a better life for my baby,” Shelly says. Freshman Caitlyn Paquette is also a teen mom. When Caity found out she was pregnant half way through eighth grade last year, her family told her “Whatever you decide, we’ll always be here for you.” Three weeks before the baby was born, Caity and her family met with an adoption agency, but before the baby was born she decided she couldn’t give it up. She was glad she made that decision. “When I saw her, I knew she was a part of me and I couldn’t give her up,” Caity says. At first her parents were concerned that the new baby might force Caity to give up on her high school career, but she is attending school regularly with the help of her own mom. Caity says being a mom has completely changed her outlook on life. She is expected to do more and better in school, and her priorities have changed. Whereas she used to be able to hang out with friends and have freedom, now it’s all about Natalie. She’s learning to handle the stresses of day to day life, but it hasn’t been easy. “She’s a lot stronger than I gave her credit for,” noted Caity’s mom, who watches the baby while Caity is in school. Although teen pregnancy rates nationwide have gone down, Mrs. Elaine Conant the school nurse says it’s a “hot topic and a very real issue,” especially with younger teens getting pregnant now. The nurses go through three steps to help any pregnant teen. Step one is when the teen comes to the nurse and informs her of the pregnancy. This allows her to provide an explanation and give her the resources she needs to make an informed decision about what to do with the baby. Step two is to discuss with the mother her decision on what to do about the baby, and how this will affect her. Step three is to see a doctor and make sure the baby is getting the medical attention it needs. “Every decision is life changing,” is one thing Mrs. Conant thinks everyone should know. Every situation brought to the nurse department is different and they will handle each accordingly, she says. Once the baby is born, teen moms are encouraged to bring their babies back to school so the nurse can see how they are doing. Bonny Eagle administrators also offer a lot of support for teen moms. After the student has to leave on maternity leave, the school provides a tutor to keep them caught up on their school work, and all their needed absences are marked down as excused. Principal Beth Schultz says she would like to see the school hold an assembly to talk about teen pregnancy and other health issues. She also thinks it would be helpful if students who take the World of Children class spend more than one night with the mechanical “Baby Think it Over” so they can get the full effect of the situation. Shelly, meanwhile, has visited school with Isabella several times to see the teachers and friends who supported her through her tough time, Even though her first thought was, “Oh no, my mom is going to kill me,” her mom has adjusted to the fact that her daughter is a teen mom. One piece of advice Shelly would give to a teen who is pregnant is to definitely get your parents involved and ask for help because it is much more stressful than those TV shows would make you think. While having Isabella changed her life drastically, Shelly says it changed it for the better. The father helped with the birth and today the couple is engaged and are planning on getting married next September. “Having Isabella made me realize I wanted to do better,” Shelly says.